You're recovering from your Thanksgiving gluttony...what dress or blouse do you reach for? Your black one. 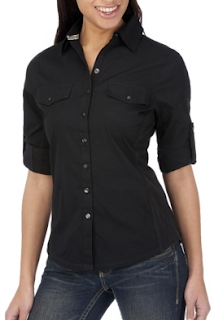 My favorite slimming black blouse is this Converse 3/4 length button-up. It works wonders for the middle! For my nails, I felt like elongating them with a little optical trickery. To do that, I reached for Time Off (the Sinful Colors nail art brush), Flyin' High (China Glaze), and I Lily Love You (OPI). I quite like the effect. Flyin' High was deepened and tinted purple with I Lily Love You. Made it a much more muted sky blue than the bottle appears sans-effects. Like the non-dominant hand striping skills? How about the new stamp for my photos? Beautiful! 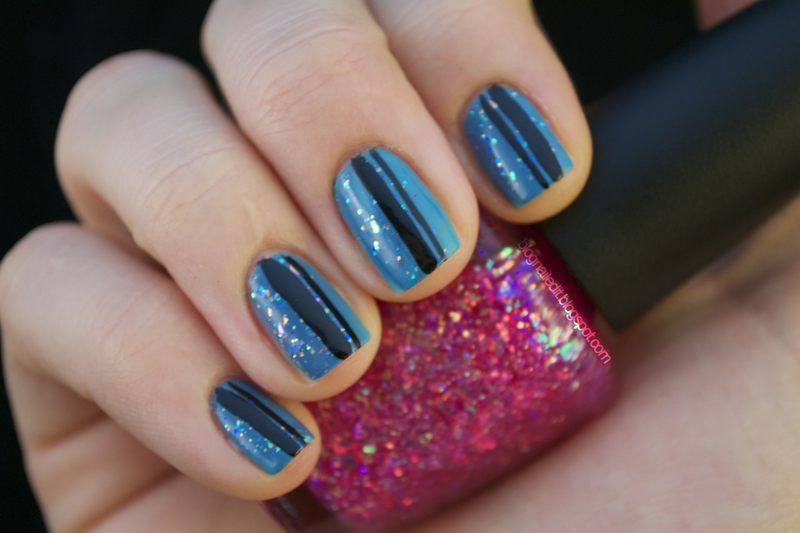 I love the sparkling blue! Is that pink puke?? OMG I am such a problem child arent' I???? Hii ! You have a very nice blog! I love your shares ( manicures) i follow you and i wish follow me back ! !